Menu95.exe was shipped with nearly every Twilight release since May 1997. 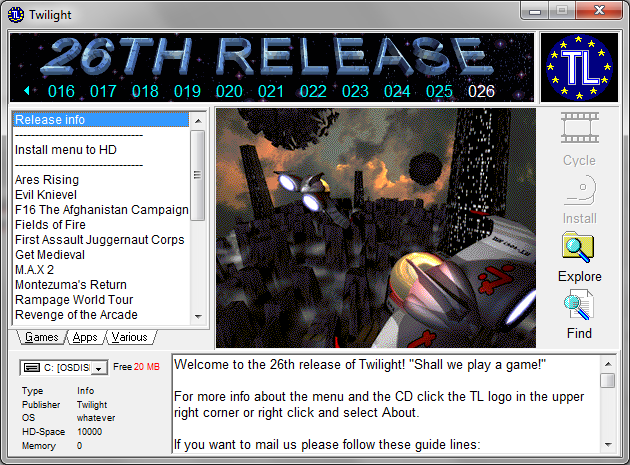 Menu95 allows easy acces and installation of software released on Twilight, ease of use was a fundamental part of the series succes. When we look closer at the menu, could we find something that we didn’t know before? Time to enter the world of decompilation and inspect every part that Menu95.exe has to offer. The menu to be dissected in this article was taken from Twilight 26. The design of Menu95 is simple and straigtforward. This is exactly why it works for most computer-savy users: it works just like you would expect. The window-size is fixed, back in they day it was pretty big. Disk space monitor and space-needed indication. Pictures and specifications on every game and application. Cool graphics, matching the CD artwork. The menu was made with the Delphi computer language. This means it can be easily de-compiled (deconstructed), revealing every aspect of the application as a seperate part. Doing this might uncover some extra information that the menu developers had inserted during build. Are there any easter eggs? An RTF file called TLINFO, displayed in a popup window when clicking the TL logo. Structured data of every release: this is shown when selecting a different release in the list under “26TH RELEASE”. Table definitions for the .001 file. This file is a bundle of other files (a winrar file). Not so special strings for warnings and error messages and various default images and cursors. Show and tell: lets review the separate parts and hidden treasures: TLINFO, Release images, winrar-tables and the Delphi forms. Welcome, once again, to another great release of Twilight! We hope you’ll all enjoy this great collection of software! The contents is divided into three sections: Games, Apps and Various. This accomodates for easy browsing in the area you’re interested in. A tranlation between the .001 file and the games.oo1 file on the first CD (CD A). The second cd just contains folders, not using the RAR container. As shown below, the file crew.rar is stored in the RAR container. The RAR container is probably used to reduce file size. Last but not least menu95 holds some unencrypted / unobfuscated Delphi forms. These can be exported and edited by a Delphi editing tool. One still exists as of today, called Delphi XE3. It largely has the same or less functionality/usability as Borland Delphi 4. It’s a shame the language is so ill-treated by it’s new owners “Embercadero”. Back to the forms: you can edit them with Delphi XE3. Below you can see the structure of the form, where it is easy to move and change components. The important parts are the images. Resource Hacker made it easy to export the Delphi forms, but the images on the form are stored in a hexidecimal “TImage” format. This format cannot easily be changed to BMP, although they are BMP images. Menu95 is a basic and straight-forward functioning application. It does exactly what it is supposed to and that with an intuitive user-interface. The decompilation process was easy and straightforward, using free or trial tools publicy available. 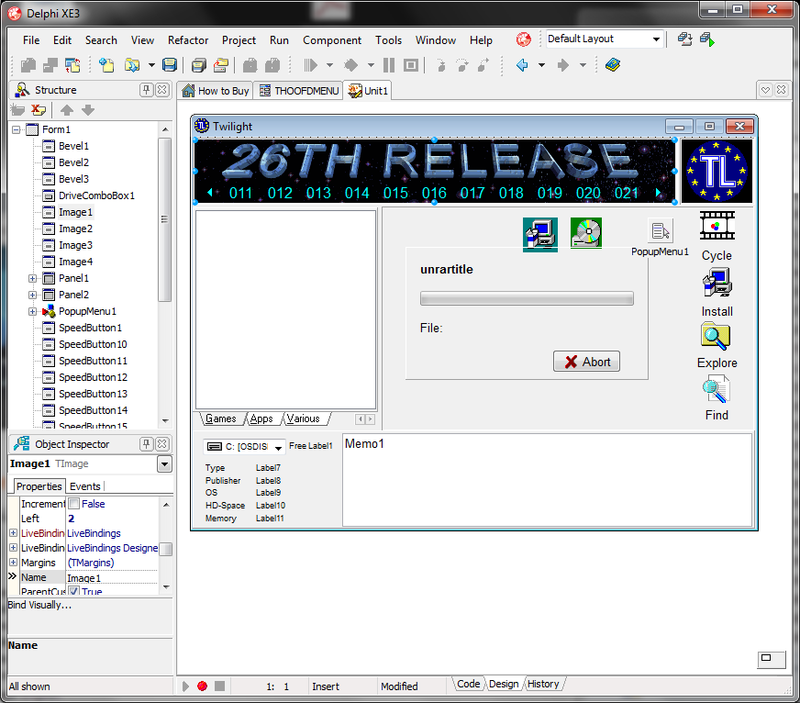 Components inside the menu95 application do not have a distinguishing name: the images TL and 26TH RELEASE are called TImage1 and TImage2. Labels and buttons are called Label1, Label2, Button1, Button2, etcetera. There is nothing special about this application. Being exceptionally un-special is what makes this menu useful even after 15 years of publication. Browsing still works, disk-space indication still works and it might even be the case that installation also works like a charm. On the other hand, many old games probably don’t work. Maybe Awesome Retro will test this one day. Being not special means no special easter-eggs have been found. But the experience of decompiling was educational, easy and fun. Do try this at home soon. Menu95 from various editions will be shared on this website in the Downloads section.